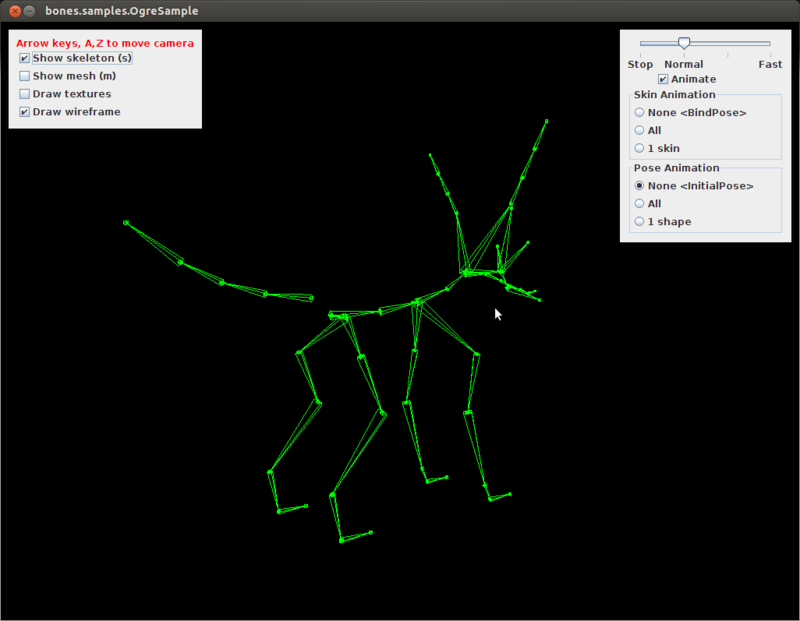 First i made an dog-animation "run without position-moving"(which means the dog just run in situ). The animation played fine on my phone. The dog's body moved, but the tail didn't move with the body. The tail seemed to stretched from origin position to where the dog's body moved to. I tried jme3 with the same .mesh.xml and .skeleton.xml , evething was ok.
Shall i send the xml-file to you? I will try .xml instead of .bones. that's strange and shouldn't happen. can you please double check if it seems ok in OgreMax viewer and has a problem in Bones? .xml or .bones shouldn't differ. .bones format is created by first laoding xml files. I have checked again. The same mesh+skeleton played fine in OgreMax-WinViewer, but strange on phone with .bones(tail stretched). I am not sure how to use .xml instead of .bones, so i don't know if the result are some difference between them. Could you do a test with my .xml? This problem bore me a long time. Thanks! I am not sure how to use .xml instead of .bones, so i don't know if the result are some difference between them. Yes, i prefer .bones too. And i have sent the files to you, thanks! yes, there is definetely a flaw there. jME shows it correct to. I will investigate it in detail. ..and looking at your skeleton hierarchy, there are two root bones (without a parent): joint1 and joint5. This is uncommon, mostly there is only one root bone (without a parent) I think this may be causing the problem. Reorganize your skeleton that there is only one root bone and see if that helps. I agree that Bones should handle that and I'll try to fix it.